March Of The COTS: The Time For Tablets?, By Giles Peeters, Senior Contributing Editor and Defence Sector Director at Track24 Defence. In this latest column, Mr. Peeters considers the latest developments in commercial technology that impact MISLATCOM. Technology evolves quickly. Take Moores Law, which suggests computer processing power doubles approximately every two years. Western militaries have struggled to get to grips with this concept as they continue to labor themselves with deals that can stretch for decades (take the U.K.s BOWMAN project for example). These types of arrangements are not always a bad thing, especially when the concept of operation is complex. However, they are indicative of an ingrained way of thinking that is not flexible enough to cope with todays warfighters needs. 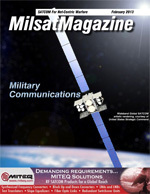 The introduction of Ka-band satellite communications (SATCOM) has changed MILSATCOM foreverand influenced commercial SATCOM as well! A major ground system component that has been dramatically affected by the advent of Ka-band is the high power amplifier (HPA). At the leading edge for driving Hosted Payloads is the United States Air Force Space & Missile Systems Center (SMC), located at Los Angeles Air Force Base in Southern California. At the forefront of innovative ideas to help overcome the many challenges that face our nation and its national security programs today, and well into the future, is Lieutenant General Ellen Pawlikowski. Debris Detection DevelopmentsThe Space Fence , Debris has the potential to be downright lethal to multi-million dollar communication and intelligence satellites, national security, astronauts and, yes, even the citizenry of Earth. Debris fills the spatial environs that surround our Earth. Once a satellite is decommissioned, or otherwise incapacitated via intentional or accidental intrusions, remnants drift dangerously within orbital slots, as well as above and below such designated orbits. Such has been going on since Earths first artificial satellite launch in 1957. I hope all of you had an enjoyable holiday season. Its that time of year again to look back, and to look forward.